If you funny people, so much into healthy/fancy foods, knew about cicoria, you would go nuts and also definitely label it a superfood (whatever that means). In fact cicoria has it all: it’s rich in vitamin B1, B2, C, E, it has diuretic properties, it contains flavonoids and a bunch of essential fatty acids to keep you cholesterol down and help liver and kidneys to better do their work of cleaning the organism. I mean this herb should be a superstar! But what is cicoria? Well it’s vastly widespread in italian cuisine, and comes in a lot of variants. There’s the one that you can buy at the supermarket, sure, and than there are a number of wild species, things that look alike but are actually different plants, with different names from region to region, one of which you know for sure. As almost everything in the traditional italian cuisine, it started as a poor dish, and with time it ended up being a fancy delicacy. When I moved to Sweden, I found out that every garden here is infested with cicoria. More precisely the variant taraxacum officinalis, or maskros in swedish, or dandelion in english. Yes, dandelion, who would have thought! Swedes (or anyone else I suppose) don’t know they can eat it, they think it’s just another annoying and infesting weed that comes every spring to waste their otherwise perfect lawns. So I’m trying to right this wrong, ok? You can eat cicoria raw in a salad when it’s young and fresh in the beginning of spring. But after a while it becomes too bitter and needs cooking. So what you do is usually boil it for 3/5 minutes, and than sauté/fry it, and eat it as a side by itself, or use it in more elaborate dishes (with beans, as a kinda pesto, in a risotto etc.). But the difficult and time-consuming part here is the picking and the cleaning of the damn thing, so this recipe will include all steps. 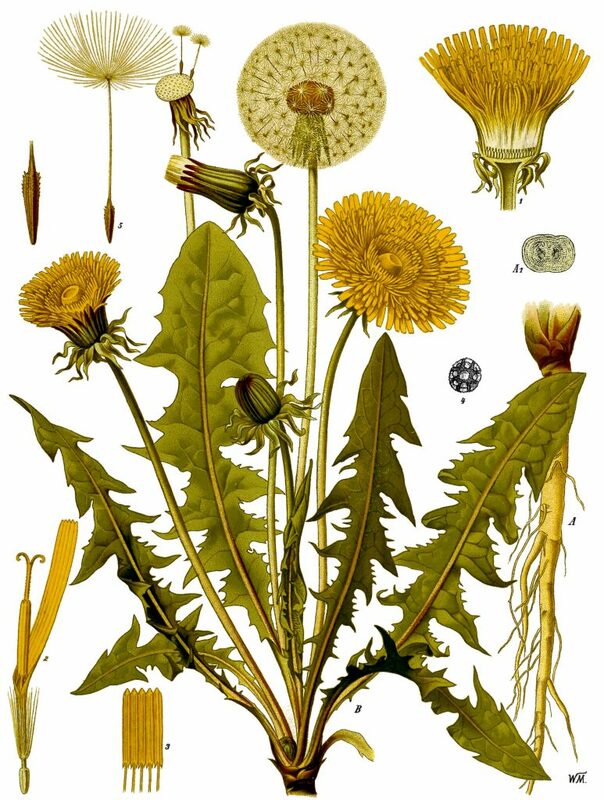 So we should first of all learn to recognize taraxacum, and that is quite simple as everybody knows dandelions yellow flowers and how they transform in soft little spheres of cottoncandy-like stuff that you can spread in the wind blowing on it. Exactly, that’s it. If you live in Italy though (or in North America, Australia and China apparently), you might even find the properly called cicoria – Cichorium intybus – very similar to taraxacum but with light blue/purple flowers. I use a knife to cut the dandelion plant just over the roots so the leaves will hold together (which will come handy while washing it). When I do this, I also try to manually clean it from dirt attached to it, dry leaves, or everything else that doesn’t look nice: insects, flower stems, other type of weed etc. After you’ve picked a bunch of these, let’s say roughly 10/15 plants, it’s time to wash them well, and this is a long and tedious job, especially if you haven’t manually cleaned the plant in the previous step. Put all the plants in the kitchen sink and add water until all the dandelions are happily floating. Use your hands moving the leaves around almost as it was some kind of washing machine. Pick each plant and remove the roots, half-chewed-by-insects leaves and other ‘alien’ parts. Move the plants/leaves to a separate sink or bowl; the water will be brown, full of dirt, insects, pieces of other weed etc. Repeat the previous point until the water remains clean. If necessary, pick each plant or leave, and clean it under running water individually. Put a big enough pot of unsalted water on the stove and add the dandelions, It will take some time to reach the boiling point (use a lid to make it quicker), but more or less when the water boils than you can take the greens out. They should have left some of the bitterness, and the water should be a ‘nice’ military green by now. Or you can add the dandelions to the water already boiling, and let it go for 3/4 minutes. It’s up to you, just don’t overcook it, you want to keep some structure to the leaves. Take them out of the water at once, using a fork, and leave them to drain in a colander. Add abundant olive oil to a big non-stick frying pan or wok, together with one or two cloves of garlic and some chili pepper flakes (to taste). When the oil start to fizzle and the garlic becomes golden brown add the dandelions. Keep stirring them with a wooden fork or spatula on medium-high, add salt to taste and keep going for 5/10 minutes. They’re ready to go. They will keep some of the bitterness (unless you don’t boil them too much) and an earthy taste, which are their beloved characteristics. You will find them in every restaurant in the Rome region, and in general in the center-south of Italy, served as a side to meat or fish, together with some aged strong cheese or in more elaborated dishes. I even love them in burgers, go figure! Pro tip: pick a bunch of this beauties when it’s the right season (spring to autumn), boil them, drain them, and then freeze them in small portions so you’ll have cicoria during all of winter. It’s a lot of work cleaning all the weed, but it’s worth it.